Episode 5, “Unplugged,” aired on October 20, 2010, brought in almost 12 million viewers, which is slightly better than the previous week. This is actually the first time the number of viewers has increased this season. Manny and Gloria are frustrated with a neighbor’s dog that barks non-stop, so Gloria confronts her neighbor about his barking dog. The neighbor tells them to ignore it like he does their parrot, which they don’t have (he was referring to Gloria‘s squawking). Later, the neighbor comes to Jay’s door accusing them of stealing his dog. Jay, in an documentary scene, informs us that Gloria is too comfortable with killing animals, like the time she chopped of a rat‘s head with a shovel. Jay later asks Manny if he thinks his mother did something with the dog; Manny tells him to not ask questions to which he doesn’t want answers. Jay goes to the garage to check out the shovel and a curious Manny joins him. Then Gloria catches them! Manny tells on Jay, who calls him a rat., which makes Manny freak out because his mother kills rats. After beating around the bush for a few minutes, Gloria confesses that she gave the dog to someone who has lots of room for the dog to run around. 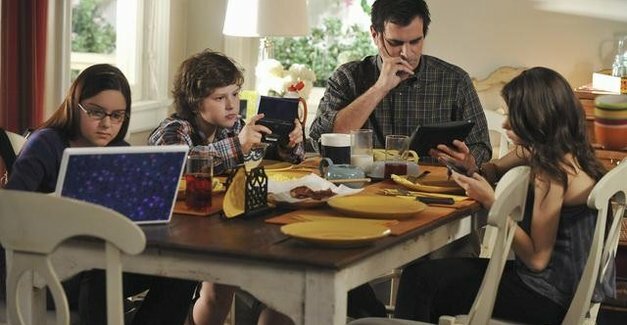 At the Dunphy house, Claire and Phil tell the kids to stop using electronics at the breakfast table and are hit with many excuses, so Phil turns it into a game; who can last the longest? It’s determined that Luke will win a chicken pot-pie if he wins, Alex will win a new computer, Haley will win a car. Phil insists that he will be able to outlast the children. Luke is the first kid to throw the contest to watch a Youtube video about a parasailing donkey. Alex is next to give in because she made a B on a paper, instead of her typical A. Haley seems like a tough competitor though. Claire finds that even though she is off the internet, the rest of the world is not. She gets flustered, uses the computer, and gets caught, leaving only Phil and Haley in the contest. While Phil reads the paper, he finds out that his fantasy football team is not doing well; he is about to give in when they hear Haley laughing, while alone, in her room. When they catch her talking on a phone, Phil immediately gets online without knowing that Haley had actually carved a bar of soap into a phone, thus making her win the competition. Stunned, Claire and Phil have to tell her that she will not get a car because they never thought she’d actually last that long. Meanwhile, Mitch finds out that all of Lily’s friends are already enrolled in pre-school, a scheme set up by their parents. Mitch calls Claire to get them an interview at Wagon Wheel Daycare. While there, they learn from the receptionist that they could easily get Lily into any school they want due to their diversity. Mitch sets up an interview at Billingsly academy, the “Harvard of preschool.” Claire calls to tell him they got into Wagon Wheel, but Mitch wants to take his chances for Billingsly, because it’s the first time being gay gives him a competitive advantage. Their interview is going great and both men are excited about Lily attending this school, but their confidence is shattered when a disabled, interracial couple with a black baby also come in for an interview. While meeting with the dean, Cam does a horribly offensive, yet humorous Native American impression out of desperation. This entry was posted in All Posts and tagged Episode 5, Modern Family, Season 2, Unplugged. Bookmark the permalink. While not the best story arc of this episode, the storyline involving Claire and Phil’s kids and electronics was a great one. My parents hate that I text during breakfast, lunch, and dinner, and although texting has undeniably had a negative impact on face-to-face communication and so forth, technological advancements such as texting and social networking sites have actually allowed for communication that crosses geographical borders. I mean, we can communicate with people in Japan. JAPAN! But texting has definitely made society more individualized and isolated.